I don't know where he got his inspiration, but hubby had a stroke of genius last week when he suggested a yummy updated to one of our usual side dishes - cheesy orzo. I present to you cheesy orzo with pancetta and peas (and yes, it could use a catchier title, but oh man, it's tasty!). The dish is quick and easy and only needs orzo, cream, cheddar, pancetta, and peas (chicken stock is optional). I don't use measurements for these kinds of dishes, so it's a taste-and-adjust-as-you-go kind of meal. Start by cooking however much orzo you want - this can be done in just plain water, or half water/half chicken stock. 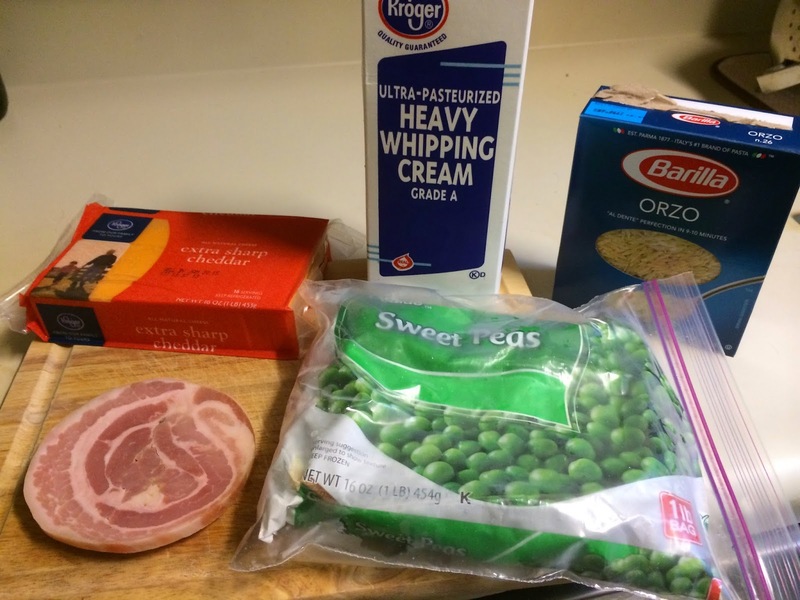 While the orzo is humming along, you will want to cook your diced (not finely diced, but not too big either - I know, not scientific, but just roll with it) pancetta (thick cut bacon would probably also work, though I haven't tried that yet). Cook the pancetta a little longer than you would usually cook bacon - the crunchy pieces will be a nice texture addition to the dish (be careful, though - I set off our smoke detectors this first time I made this). You will also want to grate your cheddar cheese and cook your peas (canned peas can also be used, but I tend to prefer the consistency of frozen peas). Once the orzo is cooked (slightly al dente, but very close to fully cooked), drain it, return it to the pot, and add some heavy cream. Then start adding the cheddar, stirring it in as you add it. 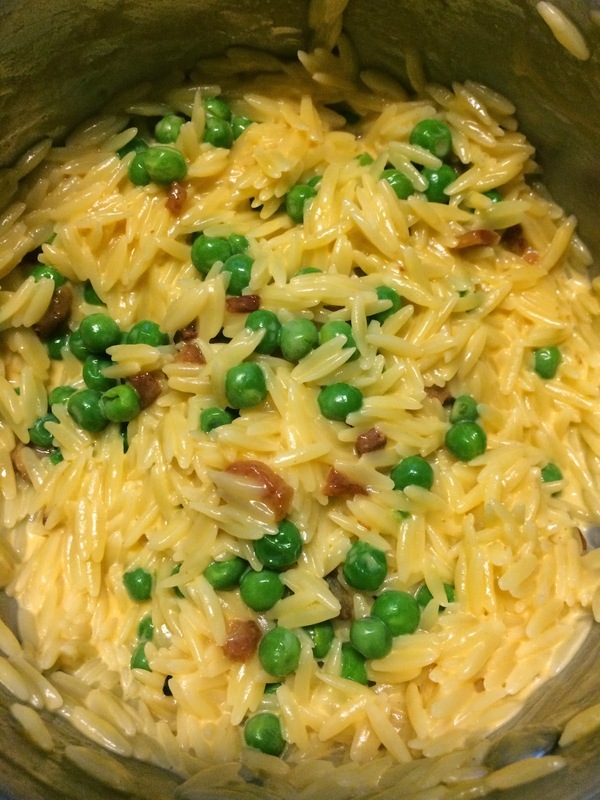 Once you are happy with the cheesiness of the orzo, just add the cooked peas and pancetta. This is a super simple side dish that is a wonderful addition to baked chicken, meatloaf, or fish, and can be adapted in so many ways to fit your preferences. Let me know what you think, if you give it a try! I'd love to hear what some others choose to add to the base of cheese & orzo. I love to cook and I enjoy improvising from recipes I find online (or watch on Food Network or the Cooking Channel) to make dishes my own. One of the super-easy recipes I make almost weekly is for Creamy Shrimp Pasta. Now, I don't have specific measurements - I tend to cook to taste, so all of these directions should be amended to whatever size meal you are making and to your specific preferences. Start some pasta cooking. Hubby likes fettuccini, so that I what I use most often, but this dish would be yummy with any kind of pasta. I use whatever size shrimp I have in the freezer (and that just depends on what I find on sale) and thaw and peel it. I then sauté some chopped garlic (I like a lot of garlic, but, again, make this to taste!) in olive oil to start cooking. Before the garlic is fully cooked, I add the thawed & peeled shrimp to cook up until they are just pink (it really only takes 3-4 minutes, depending the size of the shrimp). 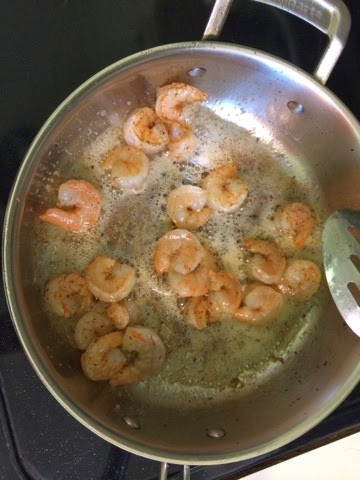 Once the shrimp are cooked, I add some white wine and let that cook to burn off a little of the alcohol (this step can absolutely be left out if you prefer!). To finish the dish, I add some heavy cream, salt, pepper and some cayenne pepper or red pepper flakes for a little heat. Then toss the sauce with the fettuccini (or your pasta of choice), perhaps grate some parmesan cheese over it (if you are cheese lovers like we are) and serve! Melt oil on medium heat in frying pan. If desired, cut chicken breasts in half (long ways) for quicker cooking time. Brush mustard on both sides of chicken. Coat both sides with bread crumbs. 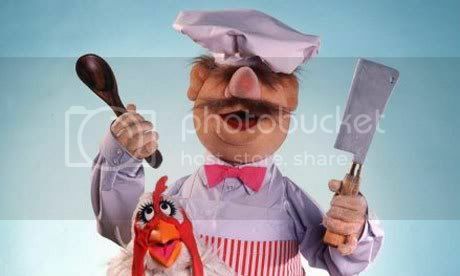 Place chicken in frying pan and cook approximately 5-7 minutes on each side or until chicken is no longer pink in the middle.